After Kansas’ loss at home to San Diego State, there was reason for fans to be a little worried about the team. Four losses in the non-conference is a lot for a team like KU but things need to put into perspective. Kansas schedule perfectly set the Jayhawks up for success. As I discussed back in November, this Jayhawk team really needed to grow up fast. With 30 days away from home, Kansas didn’t quite exactly grow up. Now? This team in its stride. Want to know how great KU’s strength of schedule is? According to the RPI, KU’s strength of schedule is No. 1 in the country. But that’s not the impressive part. The gap between No. 1 and No. 2 (Long Beach State) is as big as the gap between No. 2 and No. 83 strength of schedule. Naadir Tharpe has finally found his role. Ever since Kansas returned from their 30-day trip away from home, Naadir Tharpe has become the man the Jayhawks needed. And by the man, I mean the man. Tharpe has become the upperclassmen leader everyone, especially Bill Self, believed he would become this season. Over the past six games, Naadir Tharpe has scored in double figures four times, including three games of 17 points or more. In the two games Tharpe didn’t score double digits (vs. San Diego State and Kansas State), Tharpe turned it over zero times. In addition, he had five assists (vs. SDSU) and nine assists (vs. Kansas State). Over those six games, Tharpe totaled 79 points, 17 rebounds, 33 assists, 11 turnovers and four steals. In addition, Tharpe has shot 26-46 from the field. I could make the argument that Tharpe had his two best games ever as Jayhawk in his last two games (at Iowa State and vs. Kansas State). Tharpe was unconscious from the field (7-for-9 and 3-for-4 from the three-point line) against Iowa State and posted up a career-high 23 points. Against Kansas State, Tharpe wasn’t great from the field (1-for-7) but put up one of the better point guard stats for KU in a long time with nine assists and zero turnovers. If Tharpe remains this confident in this role, the Big 12 is in trouble. Andrew Wiggins is getting better and more confident. Wiggins has been extraordinary the past two games. His 17 point, 19 rebound performance was one of two freshman performances in the last 15 years like it against a ranked team. His 19 rebounds were the most from a Kansas player since Nick Collison had 24 points and 23 rebounds against Texas in 2003. Now, Wiggins won’t consistently grab that many rebounds (he had his career-high with minutes to spare in the first half, after all). But I think it was important for fans to see that Wiggins can be aggressive on the boards. Joel Embiid has become a better rebounder, as well, so this bodes well for Kansas in the Big 12. Wiggins’ most impressive rebound was after a missed free throw and he tipped the ball out to the perimeter, which led to an easy Perry Ellis bucket. In addition, his 22 point performance against Kansas State was great, too. It seems Wiggins shows up for the big games and that’s good news for Jayhawk fans. As always, his defense has been stellar… something I believe fans take for granted. He held Marcus Foster to one of his worst games of the season. 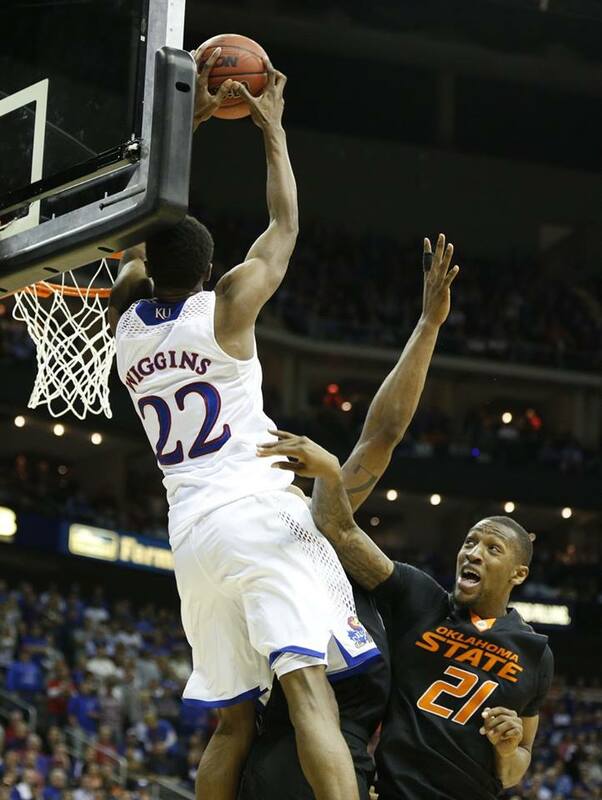 It’ll be interesting to see how much time Wiggins will play on Marcus Smart on Saturday. Joel Embiid’s “reputation” is overrated. During the Iowa State game, Embiid got called for several fouls where he was penalized for being a big human being. Fran Fraschilla even said that Embiid shouldn’t be penalized for that but that Embiid’s flagrant fouls have built him a reputation. I call BS on the reputation. Embiid needs to be careful he doesn’t build that reputation, though. Embiid isn’t a dirty player but he does need a mean streak. I think he displayed that in Iowa State. Several times, you could tell he was excited about making a big play and showed his toughness. Good luck to the rest of the Big 12 if Embiid can do that consistently. I thought the two flagrant foul calls on Embiid were fairly weak. The foul on Nino Williams should have been a flagrant one and the flagrant one in the Iowa State should have been a foul called on the Iowa State player. Next two games are extremely important. If Kansas can win the next two games, they’ll have successfully run a gauntlet early start to the Big 12 schedule. Getting wins over Oklahoma, Kansas State, Iowa State, Oklahoma State and Baylor, arguably the teams that will finish in the top six of the Big 12, would be huge. 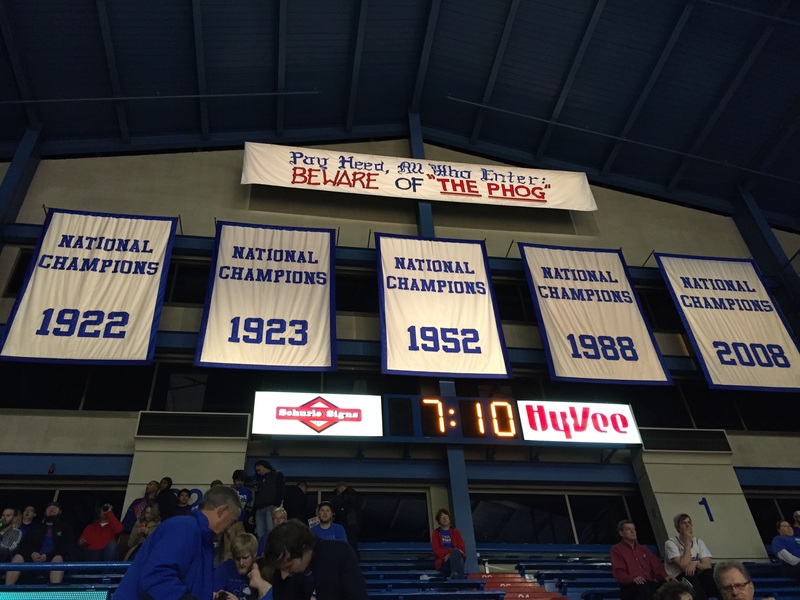 With the next two games in Allen Fieldhouse, it is certainly possible they’ll win both. At worst, they’ll go 1-1 in the next two games (Kansas just doesn’t lose two games in a row at the Fieldhouse). Get these next two wins and Kansas has a huge advantage over the rest of the Big 12. 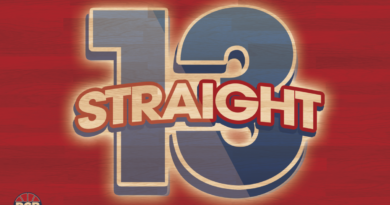 How confident are you in Kansas now that they’ve started 3-0 in conference play? What I find funny is the guy in the red shirt (seated) looking like a total pansy. Should have worn his dress to the game. Didn’t TRob have a 30-20 game? So he would be the last to have more than 19? ?